But he does remember where they went: the Tanforan Assembly Center in San Bruno, California. 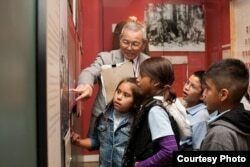 During World War II, thousands of Japanese-Americans were held there while a more permanent center was built. Yamashita, an American born in California, was one of 120,000 people detained in such camps during the war. "Really, my childhood memories began in the camp," Yamashita says. He was six-years-old at the time and is now 82. The Japanese bombing of Pearl Harbor, Hawaii, led to United States involvement in World War II. After the attack, President Franklin Roosevelt approved Executive Order 9066. The order resulted in government action against Japanese descendants living on the U.S. West Coast. They were required to leave their homes and move to 10 recently built camps. These camps were in California and six other states: Arizona, Arkansas, Colorado, Idaho, Utah, and Wyoming. To find the descendants, the federal government secretly used information collected in the 1940 U.S. census. The census is an official count of the population. It is completed every 10 years. The next census will be in 2020. It is illegal to release or use any census information to target a specific population or group. But two researchers found evidence that census officials cooperated with the federal government to find Japanese Americans. The two are Margo Anderson, a historian at the University of Wisconsin, and William Seltzer, a statistician at Fordham University in New York. Their papers showed that census officials released information, such as names and street addresses, to the government. David Inoue is head of the Japanese American Citizens League. He told VOA that, “Because of what happened to us, it is now safer to participate in the census without the fear of such action happening again." But Inoue admitted that many people still fear that census records could be used against them. 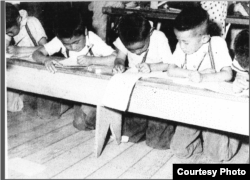 Mas Yamashita was only six when he was sent, along with his family, to live at the Topaz internment site, in Central Utah, was completed during World War II. (Courtesy: Mas Yamashita). The Japanese experience has become important to new immigrants after the U.S. Census Bureau proposed adding a citizenship question to the 2020 census form. Asking if someone is a citizen has not been done by the Census Bureau since the 1950s. In addition to collecting information about the population, the census also helps decide the number of representatives each state gets in Congress and how federal money is spent. Critics of a citizenship question say that immigrants will be less likely to answer census questions if they are asked about citizenship. They say this could change how much federal aid their communities get. The Census Bureau agrees. In documents from a 1980 case, Census officials said that adding a citizenship question would threaten the "…accuracy of the population count” because immigrant communities would be concerned about how the government will use the information. The Trump administration rejects this belief. U.S. officials say that asking about citizenship will help enforce the Voting Rights Act by confirming who has the right to vote. To Mas Yamashita, a citizenship question would be "pretty tragic." More than 70 years later, it is still painful for Yamashita to talk about his experience in detention camps. "I lost touch [with the children in the camp] after we left. I had photographs of friends that I used to play with." 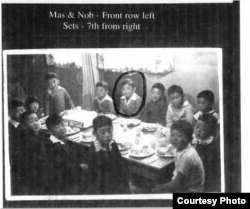 His father wanted him to attend a Japanese school, but instead he tried to stay away from his Japanese culture. "[There] were a couple of [Japanese schools] in the city, but I lied because I didn't want to have anything to do with the Japanese," Yamashita said. "So I didn't go. To this day, I don't speak Japanese. I can't read or write [in Japanese.] Most of the people I know, my age, don't speak or write Japanese. I think we all felt the same way in the sense that we didn't want anything to do with the Japanese culture when we got out," he said. Yamashita remembers having fights in school with students who made fun of him for being different. He also ignored the only other Asian student in his class. "I didn't talk to her until we reached high school,” he said. Mas Yamashita spent many years working in the advertising industry. Now, he volunteers at the Japanese American National Museum to help "make up" for all the time he avoided the Japanese community. "We have to make sure that we record all these stories. We have to keep telling them to future generations. All of my older sisters and brothers are gone and they never got around to do that," he said. "After we got out, nobody ever talked about it. Nobody," he said. Aline Barros reported this story for VOANews.com. Phil Dierking adapted her story for Learning English. George Grow was the editor. Do you think a citizenship question should be included on a country’s Census? Write to us in the Comments Section or on our Facebook page.